But once inside the restaurant, I came face to face with an astounding sight. There I saw it. Behold! The future!!! Or, more specifically, an electronic ordering kiosk. I placed my order, swiped my credit card, and a few moments later, a human being brought me my fried bounty. Total time: four minutes. 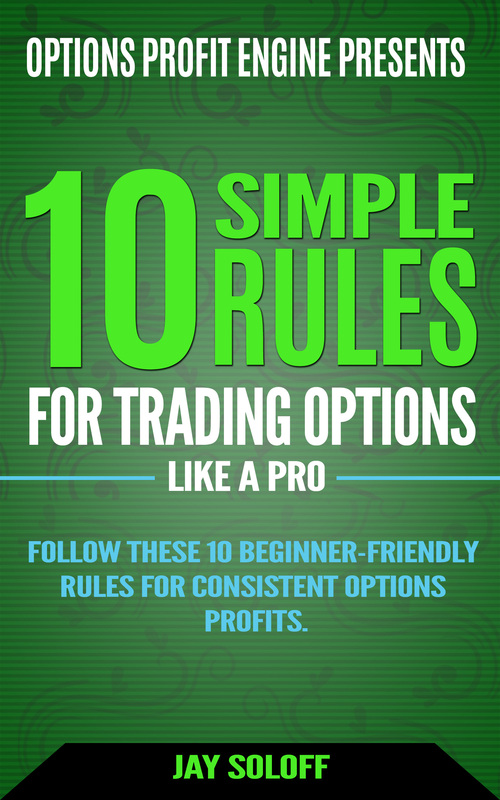 It couldn’t have been easier or more convenient. These kiosks are popping up around the country. McDonald’s says it’s planning 1,000 new kiosks a quarter. Actually, the U.S. market is behind Europe and Canada, where the kiosks more established. At first sight, the kiosk seemed odd, but it really shouldn’t. After all, much of our world is being automated. It’s changing our economy, and even changing our culture. Could we eventually see a day when a McDonald’s is run by machines? I think so. Science fiction has had a lot of play with this idea, but what’s interesting to me is that the movies have looked at the macro scene, with big robots like Skynet and the HAL 9000. But what’s more intriguing is the micro level. How will an automated world impact boring mundane transactions? The world of automation is loaded with investing opportunities, but investors need to be careful. Not every stock in this sector will be a winner, but a few have the potential to see fantastic returns. I’ll give you two such examples. 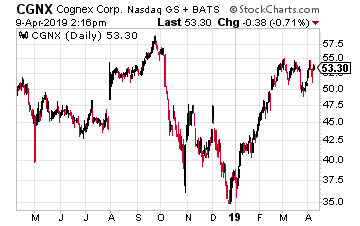 Cognex (CGNX) is what I call the “Terminator” stock. They’re the world’s leading supplier of machine-vision products. Simply put, they help machines see. These products have dozens of applications. For example, they make code readers that deliver fast and accurate reading of both 1-D and 2-D barcodes. These systems are far more accurate than laser-based ones, and they’re easier for people to work with. On the assembly line, machine-vision products can detect defects, monitor production lines, guide assembly robots, and track, sort and identify parts such as engine parts and semiconductors. Apple is a key customer. I especially like that Cognex’s gross margins are near 80%. Their last several earnings reports have topped expectations, but the stock is down after a raucous rally in 2016 and 2017. I think the lower price gives us an opening. The next earnings report is due on April 29 after the closing bell. The consensus on Wall Street is for 17 cents per share. I’m expecting another beat. 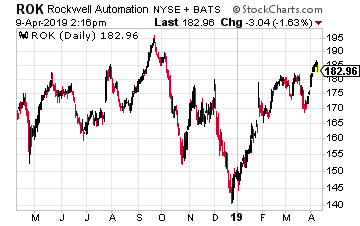 The other stock is Rockwell Automation (ROK). This is the largest company in the world dedicated to industrial automation and information. Last year, Rockwell had revenue of $6.6 billion. The company is over 100 years old, and they have operations in more than 80 counties. Rockwell has 23,000 employees. When you think of any assembly line with robot arms flinging parts around, you’re probably picturing Rockwell. Let me break down their business. Rockwell gets about half of its sales from heavy industries like energy, mining, paper and chemicals. Another 30% comes from consumer industries like food and beverage, home and personal care, and life sciences. Another 15% comes from transportation, and the final 5% is from a scattering of industries. Truth be told, Rockwell is more of an industrial-software company. I say that because 70% of their sales include some sort of software. Rockwell has two operating divisions. The slightly larger one is their Control Products & Solutions division. That accounts for 55% of sales. This division deals with motor-control products. The other division is Architecture & Software. This unit runs Rockwell’s control and information architecture capable of connecting a customer’s entire fabrication operations. Both units have been doing very well lately. For fiscal 2019, Rockwell sees adjusted earnings ranging between $8.85 and $9.15 per share. Moret added “We have had wins across all regions and in our key industry verticals, and the pipeline of opportunities is growing every day.” I have to agree. The Q1 will be coming out soon. Look for a good report. Wall Street expects earnings of $2.09 per share. Rockwell also pays a dividend which has increased for more than five years straight, albeit small at 97 cents, with the next payment coming up in a few weeks. I’ll give you a bonus. Another way to play the robotics sector is with the Robot ETF (BOTZ). 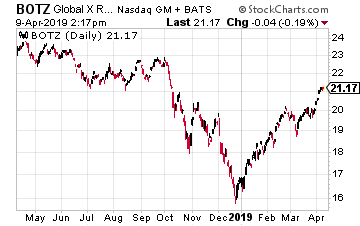 The official name of the ETF is the Global X Funds Robotics & Artificial Intelligence ETF. The benefit of owning BOTZ is that you get instant diversification within the sector. The fund currently owns 36 stocks. The largest holdings are Intuitive Surgical, Keyence and Mitsubishi. BOTZ is up 26% YTD. We’re living in an increasingly automated world. The applications are endless. It’s something to ponder they next time you ask a machine to get you a cheeseburger.